Remember those boom boxes of the 80’s? Big and bulky, with a radio and tape player. Now, we have smaller devices and thousands of songs on MP3. But our smaller devices really don’t sound better than the big bulky boomboxes. The Supertooth Disco lets you play from your iPod, iPad or iPhone with a speaker system that is portable and easy to hold. The Supertooth Disco is a Bluetooth device that can be charged up, so you have no wires when you use it. If you don’t have Bluetooth on your device, you can connect via a stereo headphones jack. The Disco has a 28 Watt speaker system with 12 Watt Subwoofer. The Disco also has a Ni MH power pack, with standby time of up to 500 hours and up to 4 hours play time at full volume. With a portable case, this device can be taken anywhere. You can control the music either through the device, or the controls (if connected to Bluetooth). Pairing is just like any other device – turn on the Disco, find the connection with Bluetooth 2.0 and put in the key code. Then start playing your music. It’s range is also impressive. I took the device about 100 feet away before I noticed any issue. So moving the speakers around the house is not an issue. The price of the Supertooth Disco is also pretty impressive. I have seen prices at $100 for this device. 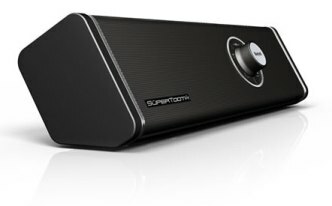 So if you need a good speaker system for your iPhone, or maybe a TV or laptop with bad sound, then the Supertooth Disco is a pretty good option.